Obtaining an appraisal on your sports memorabilia collection helps you ascertain the value of your items, whether for insurance purposes or to satisfy your curiosity. Whether you choose to do the research yourself or hire a professional appraiser should depend on the reason for the appraisal in the first place. For insurance purposes, a professional appraisal is recommended, but to satisfy your own curiosity, you can research your items yourself and get an approximate value. You can choose to get an appraisal locally or on the Internet. Most professional appraisers charge for their services based on how long it will take to research and evaluate an item. You can sometimes get your collectibles appraised for free, especially at shops that specialize in memorabilia. However, these are not always the most accurate appraisals. Generally speaking, it is better to have a local appraiser look over your collection because he can see the true condition and other details about your items that may not be apparent in pictures. This could mean a much more accurate appraisal overall. Many shops that specialize in sports collectibles and memorabilia advertise that they do appraisals. Use caution when seeking an appraisal. Not all stores have people on staff that are experienced and have been trained in professional appraisal methods. How long has the appraiser been appraising sports memorabilia? Does he belong to an Appraiser's Association? If you can't find an appraiser locally, or you want a referral to a good one, contact either the Appraiser's Association of America or the American Society of Appraisers. Both of these groups accredit their members and have registration requirements. They also have a list of appraisers all over the country and can help you find an accredited appraiser near you. This helps to ensure that you get a professional appraisal. If you can't find an appraiser locally, or you prefer the convenience of the Internet, finding an online appraisal service for your sports memorabilia is easy. You will want to ask the same questions you would ask of a local appraiser before you send in your credit card payment. Robert Connelly is a member of both of the appraiser's associations and considered an authority on numerous types of antiques and collectibles, including sports memorabilia. He does offer a free, no obligation consultation. All Authentic.com has been dealing in sports memorabilia since 1998 and has begun to offer their customers an appraisal service. Sports Artifacts does free appraisals on your items, limit of two. They are not accredited and the appraisals are not acceptable for insurance purposes. Grey Flannel Auctions buys and sells sports memorabilia as well as giving free appraisals. Instant Sports Appraisal allows you to get instant appraisals on your sports collectibles. There are several steps in appraising an item. The appraiser will examine the item closely and evaluate it for condition. He will consider the rarity of the item as well as the demand for it. He will attempt to authenticate any autograph or provenance associated with the article. He will compare the article to other, similar items that have sold recently at auction and in other venues. He will take all things into consideration when coming up with the final value of the item. 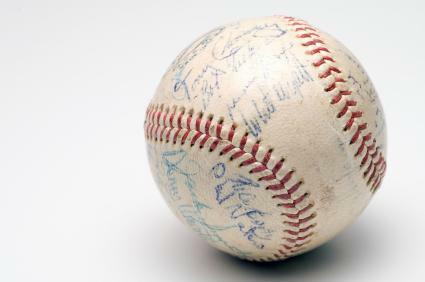 If you just want a ballpark figure and you are not worried about an appraisal for insurance purposes, you can often get a good idea of the collectible's value yourself. Evaluate the item honestly. What kind of condition is it in? Check a good collectors guide like, Warman's Sports Collectibles: A Value & Identification Guide. Look at the auction listings on eBay for items that are the same as yours. Be sure and check the completed auctions to see the final prices. You'll find a link to completed auctions on the left sidebar. Do a Google search of the item by name. For example, search 1968 Babe Ruth baseball card. Give as many details as possible. Compare your items to the others that come up in the search.. Attend shows and conventions that specialize in your category of collectibles. Networking is always a good idea and you will get a feel for what your collectibles are selling for. Check local shops and compare your collectibles to the items that they are selling. Many people start a collection by finding one special item. It is always wise to begin with something that you really like. If your passion is baseball, consider starting a baseball card, autographed baseball or bat collection. All of these items are fun to display in a sports themed room, and they may also increase in value. Some people enjoy collecting golf balls, especially if they have been autographed by their favorite players. Collectors of golf balls may later decide to only collect primitive balls, which are interesting to display, as well as increasing in value over time. Autographed basketballs are another favorite, as are soccer balls. Always collect items that have been checked by a sports memorabilia appraisal specialist. Even if you were there when the item was signed, it may have no resale value if it doesn't have a certificate from an appraiser stating it is genuine. The greatest value from collection is derived from your personal satisfaction. Would you collect a particular item if it had no resale value? Make sure you would keep the item either way so you don't clutter your attic with unwanted memorabilia. Learn as much as you can about the item you are collecting. Reading price guides and collector's guides are a great place to find basic information on any collectible. Remember, before you buy an expensive sports item, have a sports memorabilia appraisal done. Sports appraisers know how to spot a fake signature and may save you money in the long run.